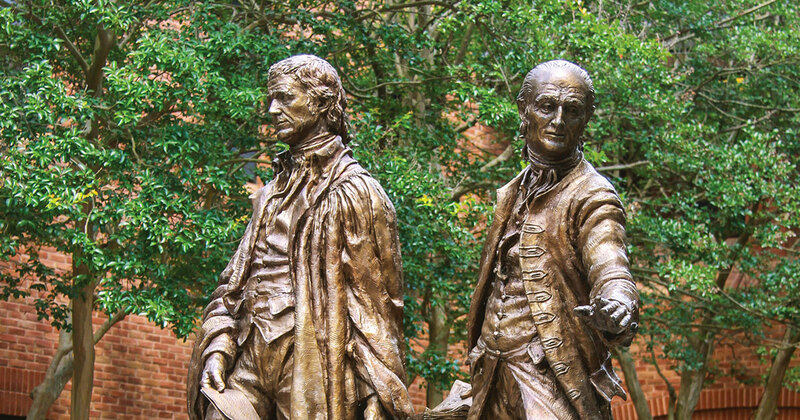 In 1779, with the American Revolution at its height, Thomas Jefferson instituted America’s first program for the academic study of law at The College of William & Mary. To guide this new experiment, Jefferson chose George Wythe, a leader of the Virginia bar and Jefferson’s mentor. Considered the most scholarly lawyer in Virginia, Wythe incorporated a range of academic subjects into the study of law, including political science, economics, history, and classical literature. Wythe envisioned legal education not only as training for legal practitioners, but also as a means “to form such characters as may be fit to succeed those which have been ornamental and useful in the national councils of America.” Many of Wythe’s students achieved prominence in the early Republic. Foremost among them was John Marshall, future chief justice of the United States Supreme Court, whose importance for the development of American constitutional law remains unequaled today. Our dedication to educating citizen lawyers who will serve with distinction in their communities, the nation, and the world.